2011 Voter Guide is Ready! 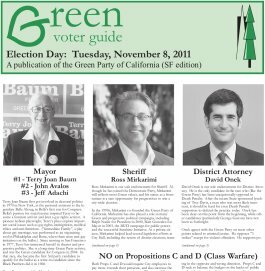 This year's Voter Guide features full endorsement statements on each issue as well as a number of articles written by Green Party members about various topics. To download a copy, or to read the text of our endorsement statements, click the Endorsements link on the left side of the page. 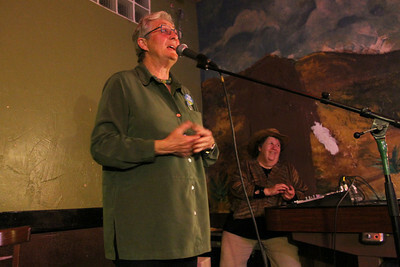 Green Party Mayoral candidate Terry Joan Baum's kickoff party last weekend was a great success! More pics are available on her website. Terry was also recently interviewed by the Huffington Post. Her upcoming debate appearances and other events are listed in the Events section on the left side of this page. Rick Wolff is a well-known Marxist economist and one of the people who first helped organize the Green Party in the United States; he also ran as a Green for Mayor of New Haven. He gave an address to the to the New York City Green Party several weeks ago about the state of the US economy ("it's over") and what's next. Wolff was optimistic about the Green Party's chances of helping to lead the country out of this mess, if we spread the message that "the emperor has no clothes" and tell people the truth about the economy. He suggested that Green ideas for how to democratize workplaces should resonate with people and provide a sensible alternative to both capitalism and state-run economies. Part of the talk was broadcast on KPFA last Saturday morning. KPFA is also giving away a Wolff book and CD as premium options for people who become members during their current fund drive, but it doesn't look like the CD is this specific talk. However, you can watch the talk online or download it from the NYC Green Party site. There is a one hour talk plus 40 minutes of Q&A, and it's well worth watching for Green Party members and others who share our values. The SF Green Party endorses the "Occupy San Francisco" movement and the expression of direct democracy that it represents. The New York City Green Party has also issued a statement in support of Occupy Wall Street. For more information, see their website, http://www.occupysf.com, and you can get live updates on Twitter at #OccupySF. OccupySF holds general assemblies (a means of making decisions through Consensus, similar to the way we make decisions in the Green Party) Sunday-Friday at 6 PM at the occupation site in front of the Federal Reserve Building downtown. All are welcome to participate, speak, and vote on Assembly proceedings. On Saturdays, they plan to hold general assemblies at noon in Union Square. Be sure to check the website for any updates.